Although the outstanding thermal insulation properties of vacuum have been recognized for many years, it is only in the last 10 years that techniques and materials have been developed to enable construction of reliable flat panels in a cost effective way. 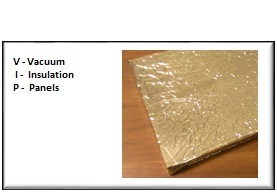 We are working with our suppliers to provide quality Vacuum Insulation Panels at affordable prices. Featuring outstanding life and over 10 times the insulation value of conventional foam, RPARTS VIPs are the perfect alternative to ineffectual traditional foams. Our 1" thick panels provide an R-value of 40 and are constructed using a proprietary core which is sealed at vacuum in a special multi-layer gas impermeable barrier membrane film. Listed below are the standard sizes currently in stock. Please note that we regularly have other sizes not listed. Please call RPARTS to obtain information on other sizes. If you wish to order more than three standard panels of any size, quantity discounts are available. Please call (831)600-7878 to obtain a quote. We can produce custom VIP panels in virtually any size and in many different shapes. While our standard VIP panels are rectangles, many of the custom panels are polygons with multiple straight sides and concave angles. To protect delicate VIP panels from being punctured, we highly recommend encasing them in 1/8" inch FRP panels. Please contact sales@rparts.com for construction details and availability information. 16" x 19" x 1.0"
12.5" x 17.25" x 1.0"
12 1/8" x 23 3/8" x 1.0"